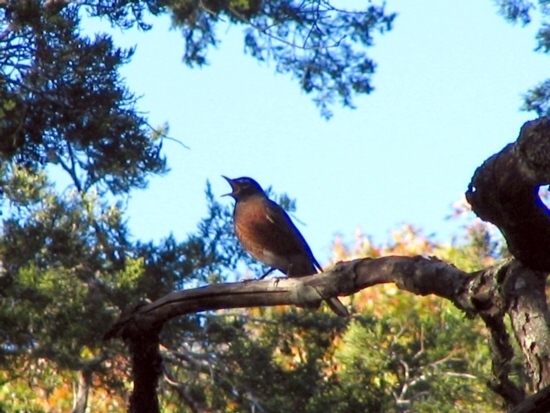 where 6 birding trails invite you to walk on guided tours for birders and Nature lovers. 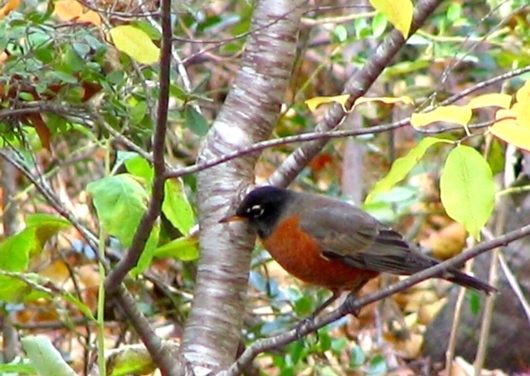 As the Latin name describes, the North American Robin is a migratory songbird. It belongs to the thrush family. On the map you can see where the Robins are on the migration route. This is a male Robin. Male and female often look very similar. 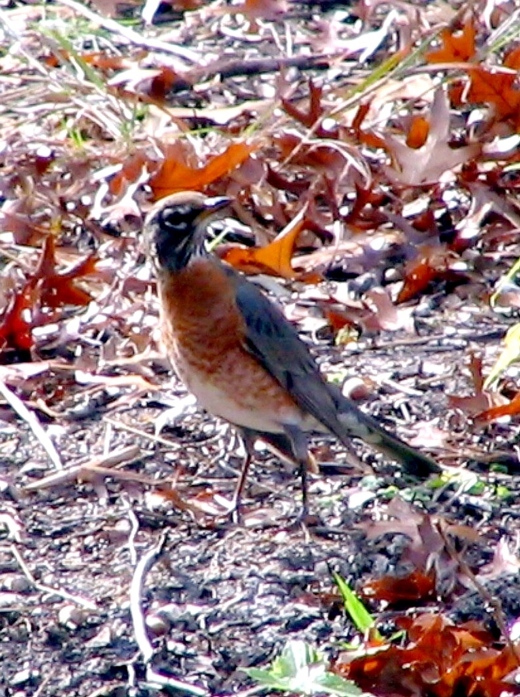 The juvenile Robin has pale colors, often dark spots on its breast. A Robin looking for food in an Escarpment Cherry. 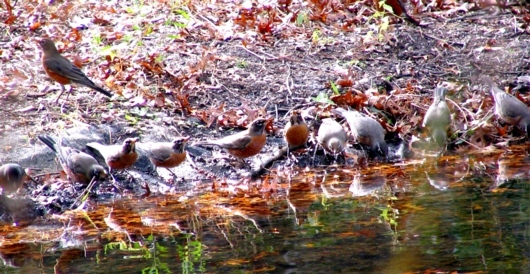 The Robin is the state bird of Connecticut, Michigan, and Wisconsin. Bear Springs Blossom Nature Preserve in the Texas Hill Country. 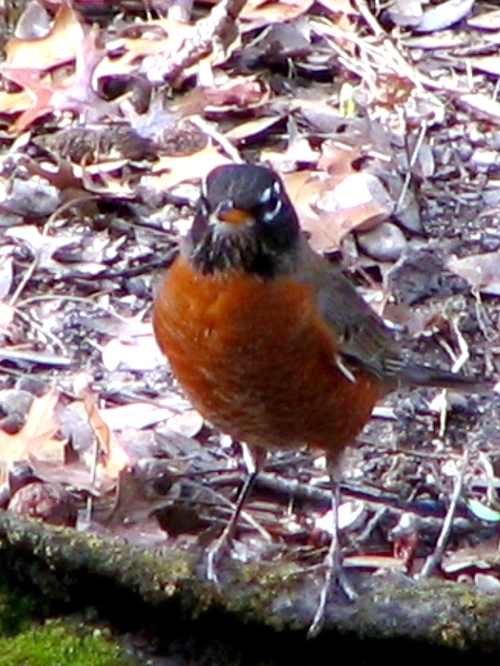 Robins have a very good eye sight. One third of Robin's food are earth worms, invertebrates, insects, caterpillars, sometimes grasshoppers, while two third are berries of wild or cultivated plants. 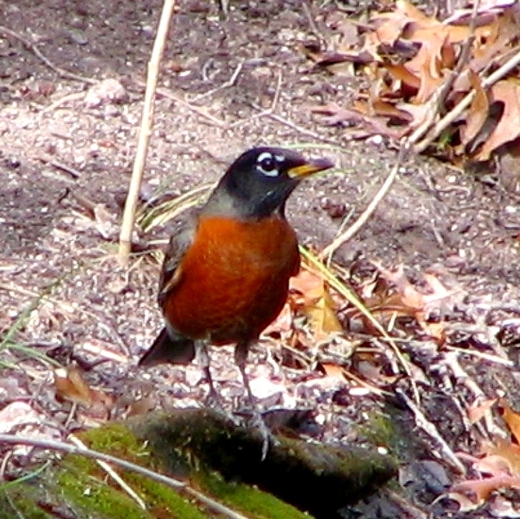 Robin's breeding places are mostly in the northern part of America, Alaska and Canada. You often can see my nest in woodland, more open farmland and urban areas. Not often I breed in the southern United States. But please protect large shade trees on meadows, I like them very much because they are home to many insects. And I love berries, don't eat them all, berries and fruits are a big part of my diet." Because of more humans, more houses, more roads, more noise, wild birds are often difficult to watch. Birding can be a challenging activity because all birds are naturally skittish. You need patience, however, the rewards are well worth it; few other activities can bring such a sense of wonder, satisfaction, connecting with nature, as well as peaceful solitude -- in today�s busy world. The best time to see most birds is usually earlier in the morning - the evening is less productive unless you are looking for nocturnal species. The BSB Nature reserve can also be called natural reserve = nature preserve = natural preserve, located in the southern Texas Hill Country. It is a protected area of importance for wildlife, flora, fauna. See very interesting fossils, hear stories about geology. We manage, conserve and protect 128 acres and provide special opportunities for Nature education, for study + research. Members from all over the Americas, Asia, Canada and Europe help us to build a better future for the next generation with healthy water and air, healthy food, and responsible use of natural resources! Nature Conservation is essential to secure a safe future! We have only this one little planet EARTH to live on! Shouldn't we keep Earth beautiful? Let's take care of Earth, save it for the next generation. Bear Springs Blossom Nature Preserve is protected forever by a conservation easement! and the future of your children! Information + Education for all who are interested in Nature conservation. BSB offers Conservation education online! Learn to understand Nature having a better life! Why your car needs so much gasoline? Why we see a rainbow? Where to find all Science lessons? Who is Flora + Fauna? A lonely bear in Texas? How do Tree Tunnels look? Why is burning plastic dangerous? Why mountains + volcanoes exist? How to keep Nature beautiful? How does an arrowhead look like? Want to train your brain?